Applied Materials’ $12.8 bln all-share takeover of the Japanese firm broke taboos in a country that is wary of foreign buyers. But after 19 months, U.S. regulators scuppered the tie-up. Investors will hope it doesn’t discourage other Japanese groups from considering bold deals. 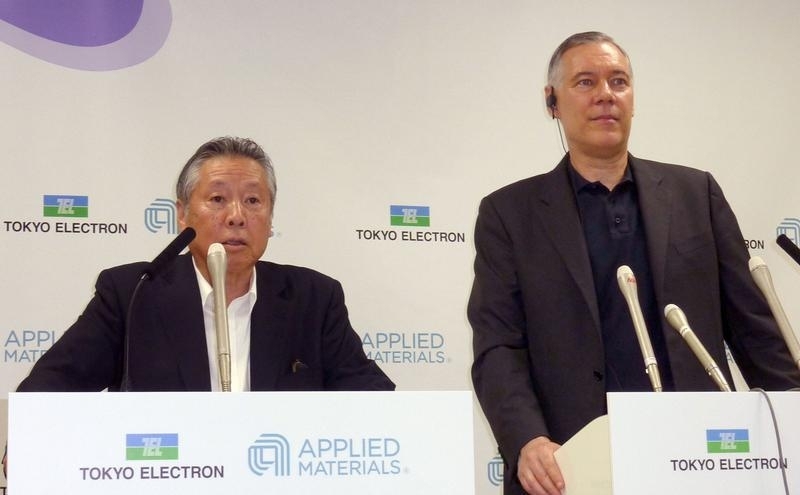 Tokyo Electron Ltd Chairman and President Tetsuro Higashi (L) and Applied Materials Inc Chief Executive Officer Gary Dickerson attend their joint news conference in Tokyo, in this photo taken by Kyodo September 24, 2013. Tokyo Electron and Applied Materials on April 27 agreed to terminate an all-stock merger that would have created a company with a combined market capitalisation of more than $38.5 billion. The companies reached the decision after the U.S. Department of Justice said a proposed remedy would not be sufficient to replace competition lost from the merger. Neither company will pay a termination fee. Under the terms of the deal announced in September 2013, Tokyo Electron shareholders would have received 3.25 shares in the newly combined company for each share they held, giving them 32 percent of the enlarged group. The new company was to be dual-listed on Nasdaq and the Tokyo Stock Exchange and incorporated in the Netherlands. Both companies said that they would buy back their own shares instead. Tokyo Electron said it would repurchase shares worth 120 billion yen ($1 billion) or 8.6 percent of its outstanding shares over the next 12 months. Applied Materials announced it would spend $3 billion to buy back its shares over the next three years.